The Dead Sea Scrolls are thought to be the remnants of a library that had been wrapped in linen cloth and stored in jars in several caves among the cliffs of Qumran near Jerusalem. The first scrolls were discovered in 1947 when an Arab herdsman came across them while searching for a stray goat. About 800 scrolls in Hebrew and Aramaic have been found, the latest in 1956. They include the oldest known manuscripts from the Old Testament, several books of the Apocrypha, some non-biblical religious manuscripts and a few secular documents. Some papyrus manuscripts contain exact dates when they were written and others have been dated using paleography, a method of determining a date from the style of characters. Carbon 14 dating has been used to confirm the dates of these scrolls. There had been some suggestion that one of the scrolls, the Habakkuk, referred to Jesus of Nazareth or John the Baptist. But a manuscript that was a commentary of the Habakkuk has been shown, by way of carbon 14 dating, to be have originated between 150 and 5 BCE. A direct challenge to the theory of the Bering Land Bridge, this book asserts that the first Americans were fishermen who arrived by boat some 2,000 years before the first Clovis settlers in North America. In the middle are the bones of a man believed to have lived 9,200 years ago to the age of 45 who was wounded by a stone projectile. Archeologist have come to realize that Stonehenge was built in three stages. The first stage was a circle of wooden timbers surrounded by a ditch. Excavations of the ditch revealed many animal bones and deer antlers that had been buried in the ditch. Carbon 14 dating of this material has revealed that the first circle of Stonehenge was constructed in about 3100 BCE. Carbon 14 dating has confirmed that Hezekiah’s Tunnel at the pool of Siloam dates back to the reign of King Hezekiah in 700 BCE. Testing was conducted on organic material in the tunnel by researchers from Hebrew University, the Israel Geological Authority and Reading University in England. 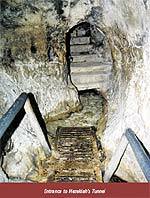 Accounts in the Old Testament say that the tunnel was dug to bring water into the city during a siege. But an inscription discovered in a Turkish museum had suggested that the tunnel was from 200 BCE. The view that man did not arrive on the American continent before the last glaciation has been supported by the fact that until now the known and dated archaeological sites have not been of very great antiquity. But now we report radiocarbon dates from a Brazilian site which establish that early man was living in South America at least 32,000 years ago. These new findings come from the large painted rock shelter of Boqueirao do Sitio da Pedra Furada, the walls and ceiling of which are decorated with a rich set of prehistoric paintings. We have excavated a sequence containing abundant lithic industry and well-structured hearths at all levels. Carbon 14 dates from charcoal establish a continuous chronology indicating human occupation from 6,160 ± 130 to 32, 160 ± 100 years BP. A date of 17,000 ± 400 BP, obtained from charcoal found in a level with fragments of a pictograph fallen from the walls, testifies to the antiquity of rupestral art in the region of Brazil." Carbon 14 dating is helping to map the migrations of ancient peoples throughout the America's, Asia, Africa and Europe and throughout the world; expand our knowledge of ancient civilizations and clarify and validate the dates of artifacts. Spliced thread showing dye used to match other material. Found in the carbon 14 sample area. UV photograph showing that carbon 14 sample area is chemically different than the rest of the Shroud of Turin. Low level x-ray image of the carbon 14 sample area. Transmitted light photograph of the carbon 14 sample area.